1. What is ORCiD? Why should I care? ORCiD ® stands for Open Researcher and Contributor Identification. ORCiD is an open, non-profit, global, community-driven initiative to disambiguate authors of scholarly work and to better connect researchers to their research output and to each other. ORCiD provides a persistent digital identifier that distinguishes you from every other researcher, and linkages that ensure your work is recognized. ORCiD members – academic institutions, funding agencies, publishers and others – are collaborating to create a repository of unique scholar identification numbers (ORCiDs) and to integrate these IDs into key research workflows, including manuscript and grant submission. The integrations support automated linkages between you, your professional work, and your funding. For updated information about ORCiD integrations, see Member Integrations. To see who is involved in ORCiD, see the lists of sponsors and members. For more information about the ORCiD organisation, see the ORCiD FAQ. 2. Why should I have an ORCiD? What's in it for me? An ORCiD iD is a persistent identifier that will distinguish you from other researchers throughout your scholarly career and resolves authorship confusion in scholarly work. Publishers, funding agencies, academic institutions and other entities involved in the scholarly process have joined together to integrate ORCiD into scholarly workflows to reduce the administrative burden of author disambiguation, saving you the researcher, precious time. Ensuring researchers get credit for their work. Reducing time to identify scholarly output. Enabling scholars to keep track of and report on their work with funders, publishers and institutions. Tying individuals to their scholarly work should make finding academic papers easier and more accurate. Grant funder integration: Grant funding bodies including ANDS (Australian National Data Service) and the Australian Research Council (ARC) and the National Health and Medical Research Council (NHMRC) have or are in the process of building integration with ORCiD. The applicant profile section of NHMRC’s Research Grants Management System (RGMS) was changed in 2014 to allow researchers to include their unique identifier (such as ORCiD) when updating their CV and Profile, whilst the ARC is currently considering options for the development of a similar capacity within its Research Management System (RMS 2.0). 3. I’ve accidentally created a duplicate record? What do I do now? Not to worry, in the event of duplicate record creation the ORCiD Support team can help users with multiple records to mark one ORCiD iD as a primary one, and the other iD as deprecated. Because ORCiD identifiers are designed to be persistent, obsolete iDs will be deprecated, not deleted. The record associated with a deprecated iD contains only a pointer to the primary record. Accessing a deprecated ORCiD record redirects the requestor to the primary record, both in the user interface and the API. An example of a deprecated record is at http://orcid.org/0000-0001-6151-2200. Access granted by a user on a record that has been deprecated does not transfer to the related primary record. Members will need to request that the user re-grant authorization with their primary ORCiD. ORCiD relies on individuals to report duplicate records. ORCiD will assist users with combining their own records. They will also take into consideration reports from the community about potential duplicates or incorrect data. In either case, users should contact the ORCiD Support team to report an issue and include the ORCiD identifiers of the records in question. In the event that data in a Record may need to be corrected, ORCiD will follow their published Dispute Procedures. Once combined, ORCiD records can NOT be restored to their original state. For this reason they are conservative about deprecating/combining records, and require proof of ownership and authorization from the iD holder before apparent duplicates are managed. 4. What does ORCiD membership do for funding agencies? Member funding organisations can establish trusted relationships with grantees to receive updates on their research activities, thereby reducing application and post-award reporting requirements, including repository deposits. Member funders that integrate ORCiD into their grantee databases can reduce duplicate records and perform cross-organisation data exchange and record management. 5. How do I get an ORCiD? Sign up is quick and simple. Sign in to the University’s research reporting system RePortal, click on the ORCiD icon in the banner. Select Connect or Create your ORCiD, sign up with your name and email. As a final step, authorise Flinders University access. 6. What if I already have an ORCiD? Connect your account to Flinders University. Sign in to the University’s research reporting system RePortal, click on the ORCiD icon in your dashboard. Select Connect or Create your ORCiD, connect your existing record by signing in to your ORCiD account. As a final step, authorise Flinders University access. 7. How do I know if I have an ORCiD? If you can’t remember if you registered for an ORCiD, search your name in the ORCID registry. If you already have an ORCiD sign in to the University’s research reporting system RePortal, click on the ORCiD icon on your dashboard. Select Connect or Create your ORCiD, connect your existing record by signing in to your ORCiD account. As a final step, authorise Flinders University access. If you do not have an ORCiD sign in to the University’s research reporting system RePortal, click on the ORCiD icon on your dashboard Select Connect or Create your ORCiD, sign up with your name and email. As a final step, authorise Flinders University access. 8. Will Flinders University create an ORCiD for me? No, you will create your ORCiD yourself through the University’s research reporting system (RePortal). Evidence suggests that creating ORCiD accounts on behalf of researchers is not an effective method for uptake and use. A ‘create on demand’ model, where researchers create records for themselves facilitated by their institution, has demonstrated more effective uptake. Creation of the basic ORCiD account takes 30 seconds and requires your name, email and password. Connecting your ORCiD to Flinders University requires you to simply sign in to ORCiD via RePortal. 9. How do I change the name associated with my ORCiD account? Go to https://orcid.org/signin and login to your ORCiD account. Click the pencil icon to the right of your name at the top of the column on the left. Enter the name you want associated with your ORCiD account. Click the Save Changes button beneath the name fields. 10. How do I add email addresses to my ORCiD? How do I change the primary email address? Login to ORCiD, click the Account Settings tab under the banner at the top of the page, then click Edit on the Email line. Enter a new email address at the prompt and click Add. ORCiD will prompt you for the password to the added email account and send a message to this account; click on the link in this message to verify the email address added to your ORCiD account. Click Set Primary adjacent to the email address you want to be the Primary. You cannot delete your Primary Email address, but you can delete other email addresses by clicking the trash-can icon adjacent to the address. 11. Why connect or create an ORCiD through Flinders University? Flinders University views ORCiD as an increasingly important part of the scholarly research cycle. As more and more member organisations build automated integrations with ORCiD, having an up-to-date ORCiD will increasingly reduce the administrative burden on you as a researcher and make it easier to disambiguate you and your work. Flinders University is asking for “write access” to your ORCiD paving the way for two-way data exchange in the future. 12. Who can see my ORCiD record? How do I set up access controls? Anyone can see your ORCiD. By default, with the exception of your email address, information in your ORCiD is publicly available. However, only your name and ORCiD must be publicly available. You control access to any other information you add to your ORCiD record. You can choose among three levels of security: Public (anyone can see it); Limited (you authorise Trusted Parties to see it); and Private (only you can see it.) Simply login to ORCiD and use the icons to the right of each item in your record to set the access control you want. Flinders University suggests you maintain the ORCiD default settings, but control of your ORCiD account resides with you. 13. When will I use my ORCiD? You might be asked for your ORCiD when submitting a grant proposal or article manuscript. You might also want to add it to your web profile, your CV, or any place you list your research. ORCiD recommends using the URL form of your ORCiD identifier, e.g., http://orcid.org/0000-0002-8040-822X. 14. Who manages my ORCiD? You manage the content of your ORCiD account. The ORCiD is yours, and stays with you throughout your scholarly career. You can make the most of your ORCiD by updating your ORCiD account and using your ORCiD wherever possible in your research practice. 15. Will my ORCiD populate automatically with my research output? 16. How do I import my citations into ORCiD? As more organisations integrate their resources with ORCiD, you will be able to import citations from them. You should login to ORCiD periodically to import new citations from existing integrations and to check for new resource integrations with ORCiD. You can also choose to receive email notifications of new integrations and other ORCiD updates. You can also add citations to your profile manually. 17. How can I receive email notifications of new ORCiD integrations? You can sign up to receive notifications when you register for an ORCiD or when you create your ORCiD account. In the Notification Email section of the pop-up webpage, check the box to receive ORCiD news. If you already have an ORCiD account, login to ORCiD, click the Account Settings tab under the banner at the top of the page, then click Edit on the Email preferences line. 18. Can I manually add citations to my ORCiD account? Yes. 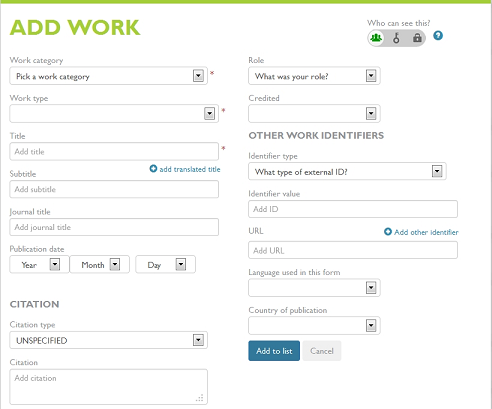 Simply login to ORCiD and click the Add Work Manually button in the Works section of your ORCiD account. This will display a template for you to enter citation information and set access control on this item. 19. Is ORCiD just for articles? No. You can import or manually enter citations for all kinds of research, including articles, monographs, technical reports, theses, dissertations, datasets, learning objects, conference papers, presentations, and grant proposals. 20. Does ORCiD support citations in non-Latin scripts? Yes, non-Latin script character sets with Unicode encoding are supported for display and search of ORCiD accounts and the ORCiD Registry. Such citations can be added to your profile manually or imported if the exporting database supports these characters. 21. What happens to my ORCiD if I leave Flinders University? Your ORCiD and record go with you. Your ORCiD record is tied to you, not your institution. You can continue adding to your ORCiD regardless of where you work or study. If you do leave, remember to update ORCiD at orcid.org. It’s important to change your affiliation and email account associated with your ORCiD. 22. Is it possible to designate a trusted individual to enter researchers’ information for them? Yes, researchers can designate trusted individuals to enter information into their ORCiD account for them, and they can remove trusted individuals from their ORCiD account. To designate a trusted individual on an ORCiD account, both the researcher and the trusted individual must have an ORCiD. Please first create or connect your ORCiD through the University’s research reporting system RePortal. Click the Accounts Setting tab in the menu bar above your ORCiD account. Scroll down to the Trusted individuals section. In the search box, enter the ORCiD, e-mail address, or name of the person you want to make a trusted individual, then click search. If you enter an email address or ORCiD, a pop-up box will ask you to confirm adding that user as a trusted individual. Click Add. A user must have an ORCiD before you can make them a trusted individual. If you search for a trusted individual by name, a list of matching ORCiD records will appear. Click the Add button next to the name of the person you want to make a trusted individual, or click on the name to display their ORCiD account. Click the Accounts Setting tab in the menu bar above your ORCiD profile. Click the trash can icon next to the Trusted individual’s name to remove them.